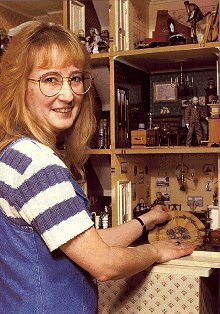 For most people, their doll’s house is an absorbing hobby, and a conversation point when people visit. For me, it has become more than that. It was the inspiration for the first of my needlepoint carpets, which I started designing around 1991. Now I have 44 designs, which I sell as kits; I have written a book featuring many of them, and work full time designing and marketing them. Sometimes it seems as if I dream carpets as well! It all started because my doll’s house, a Georgian town house which I had bought from the Covent Garden Doll’s House Shop, seemed so empty at first. It needed to be ‘softened’ somehow. I had deliberately chosen a house that came ready-decorated outside, as I doubted my painting ability at the time. I borrowed a children’s ‘Ladybird book’ from the library on electricity, so that I could work out how to put the lights in, but didn’t have any tools suitable for drilling throughout the plywood back or MDF floors and walls of the house. This explains why all the copper tape for the lighting system is visible along the front edges of the walls. Eventually, I hope to disguise this eyesore with veneer strips, but the decoration of the rooms seemed more urgent at the time. I started with the master bedroom. This has an Oriental feel to it, with its yellow chinoiserie wallpaper. All the furniture in this room, except for the corner washstand and plant stand, were made from kits. The resin fire surround was bought at a Fair without me having the Phoenix ‘cast-iron’ fire insert with me to measure it against. When I got home I found that the surround had the correct inner dimension widthways, but was too short to take the metal insert. I remedied this by carving a triple layer of ‘Grab Tabs’ until they matched the shape of the base of the surround. Stuck onto each ‘leg’ of the fire surround, they made it just tall enough to take the insert perfectly. The samplers on the wall in the bedroom are pictures cut from magazines and framed. For an embroiderer’s doll’s house, I now think this is appalling, and one day I will get around to stitching real ones. Across the landing from the bedroom is the music room. 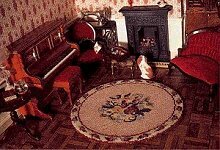 Although I cannot play any instruments, I love miniature ones, if well made, so a music room was a must. The harpsichord and harp were made to commission by Tony Scammells, and are beautiful. The recorder on the mantelpiece is by David Edwards. The cello and violin are cheap imports, which will ‘do for now’, but will probably be replaced when I see better ones…The carpet in this room was specifically designed to fill the space between the harpsichord and the fireplace, and to echo the blue in the wallpaper. Beneath the music room is the study. This is my favourite room, and, I think, reflects my own personality more than any other room in the house. People have commented that it seems like a particularly masculine room, but I think it is just a Victorian hoarder’s room. The old gentleman doll (made by Rod and Lorna Treloar of Little Women) suits this room really well. He is obviously a traveller (his trunk is at the ready), and he enjoys collecting souvenirs from the various countries he has visited. The Buddha on the mantelpiece was unearthed while I was gardening a few years ago, and seems ideal for this room. The tiny clay pagoda was bought from a shop in Polperro, Cornwall, which specialised in those huge Chinese urns which are large enough to hide a person in. Of course, the only thing I was interested in in the whole shop was the tiniest, cheapest item for sale (it only cost £1). The map above the desk is of Cornwall, because my husband was brought up there, and we love visiting the county. Also, although I like maps, there was no way I was going to display a map of Essex (where I come from)! The display cases in this room contain butterflies, semi-precious stones, birds’ eggs and fish. There is also a beautiful set of drawing instruments in a leather box, on the games table. The specimen chest in the corner was my leaving present from my job in a public library – the librarian, when presenting me with it, commented that he had never presented such an expensive, but small, item as a leaving gift. Perhaps he needs to visit a doll’s house fair, and see for himself exactly what is available? On the same floor as the study is the drawing room, which contains a gorgeous upright piano by Linda Grant ( a very generous birthday present from my husband, Chris). My ‘widow doll’ (again by Little Women) looks as if she is about to play it, which doesn’t impress the little spaniel in the slightest. Choosing this spaniel was hilarious, because my family owned a ‘real’ brown and white spaniel at the time, so I wanted to choose one that looked like him. Most of the dogs on the stall at this particular Fair were rejected because the markings weren’t quite right – but this one was perfect! This room contains my favourite item in the whole house: a tiny turned ivory pot, which contains a pair of gold wedding rings (one ‘large’ and one ‘small’). These, like the recorder in the music room, are by David Edwards. Beneath the drawing room is the kitchen. 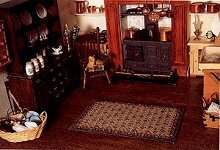 I wanted this room, although it is only 12″ deep, 11″ wide, and 10″ high, to give the impression of a country house kitchen, with its ‘batterie de cuisine’. I love copperware, so I try to collect examples of anything unusual – my favourite piece is the chocolate pot, from Carol Black. I have been searching for a bain-marie for years, but have yet to find one. The final room is the dining room. It is elegantly decorated in yellow as a print room. I used to have the table and chairs set out in the centre of the room, but once the carpet was stitched I found it couldn’t be appreciated if it was covered by furniture, so now all the furniture lines the walls instead. The house is not quite finished yet (are they ever?). The mansard roof lifts off to reveal two more rooms, which I have yet to decorate. I plan to have a bathroom and a nursery. Anticipating the nursery, I have already bought several lovely toys, which at the moment are displayed on the top landing of the main part of the house. These include a rocking horse from DAWS Rockers, and two gorgeous doll’s dolls which I bought at Ally Pally last year, from a South African exhibitor. I should really have only bought one, but I couldn’t decide which one to have (a common dilemma amongst miniaturists). Of course, the nursery will need to have a carpet designed especially for it, which brings me back to where I started… If you are looking for kits to make nursery rugs, just give me a while to use my doll’s house for inspiration, and you just may be in luck!